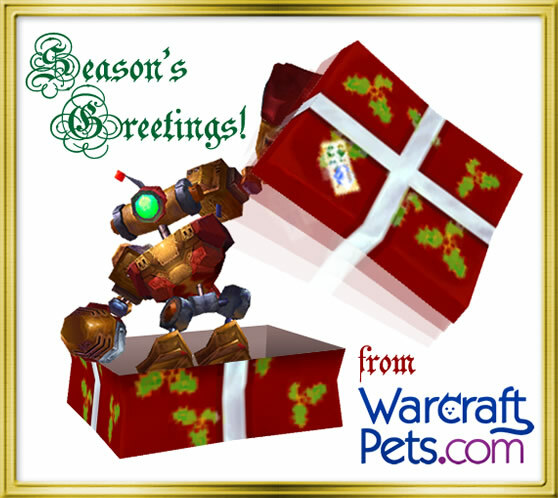 Warmest Wishes from all of us at WarcraftPets! Have a wonderful and safe holiday as well as a fun-filled Feast of Winter Veil! Don't forget to check under the holiday tree located in Ironforge and Orgrimmar starting on December 25th. Unwrap the gifts and you may find neat toys, holiday items and food, and several festive pets. Remember that the companions found under the tree are Bind on Use, so should the presents fail to yield a specific Winter Veil mini-pet you desire, be sure to check out the Auction House! Thank you for continuing to support WarcraftPets. It has been an honor to serve the pet-collecting community this past year, and we hope to continue bringing you exciting companion news throughout 2012 as well! We wish everyone a prosperous and pet-filled New Year.